Lunch served daily from 10:30 a.m. to 2:30 p.m.
Hand breaded & fried chicken tenderloins, served with fries & honey mustard. Thick cut fries topped with cheddar-jack & bacon. Served with housemade ranch. Three crab cakes served with housemade remoulade. Served with housemade tortilla chips and salsa. Topped with Monterey jack cheese, sour cream & tortilla strips. Cream based chowder, topped with cheddar, bacon & chives. Cup/bowl of soup & signature house grilled cheese. Cup/bowl of soup with chicken salad, tuna salad, pimento cheese or ham roll	. Cup/bowl of soup & wedge salad or side salad. 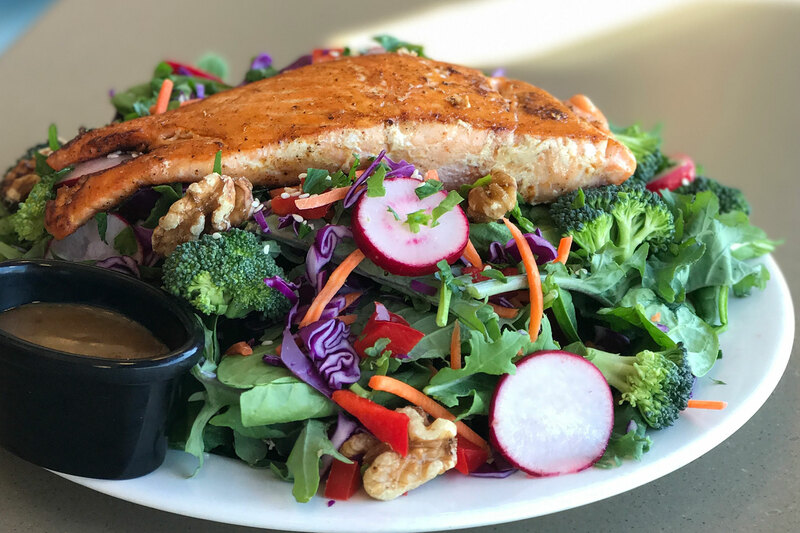 Baby spinach tossed in house-made balsamic vinaigrette, topped with bleu cheese crumbles, strawberries, mandarin oranges, spicy toasted pecans, & red onions. Romaine tossed in housemade dressing. Topped with shredded parmesan & housemade croutons. 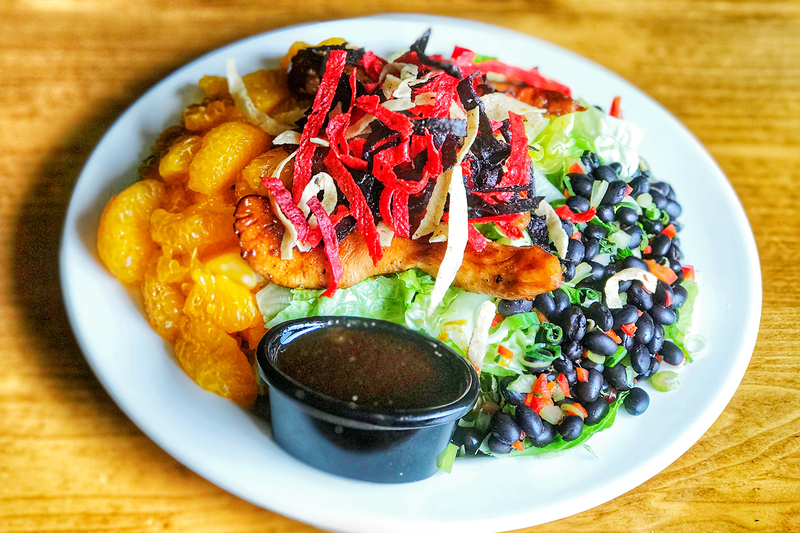 Romaine lettuce topped with marinated grilled chicken, black bean salsa, mandarin oranges, tortilla strips & housemade Caribbean vinaigrette on the side. Seasoned grilled chicken or beef, cheddar-jack, diced tomatoes, & black beans served over romaine lettuce. Served in housemade tortilla shell with sour cream, salsa & southwest ranch on the side. Three Maryland style crab cakes on top of mixed greens, with diced tomatoes & cheddar-jack. Housemade remoulade & choice of dressing on the side. Tomatoes, cucumbers, shredded cheddar-jack, rice noodles. Housemade chicken salad, tuna salad & pimento cheese. Cranberry salad & poppy seed bread. Artisan iceberg wedge, cheddar-jack cheese, bacon, tomatoes, red onion & house-made ranch. Honey mustard, bleu cheese vinaigrette, ranch, balsamic vinaigrette, southwest ranch, Caribbean vinaigrette, thousand island, low-calorie Italian, sweet poppy seed, tarragon vinaigrette, vinegar & oil. All our home-made dressings can be purchased from our cashiers! On wheat bread, served with chips & cranberry salad. Choice of chicken salad or deli sliced ham & mesquite turkey on croissant. Provolone, bacon, lettuce & tomato. Served with chips. mesquite smoked turkey, provolone, lettuce, tomato. Served with dijonaise, cranberry salad, chips & housemade sweet pickles. Sides: Thick cut fries, home fries, onion rings, fried mushrooms, fried green tomatoes, fried okra, green bean fries, potato casserole, fresh fruit, grilled asparagus or vegetable of the day. Our signature recipe seasoned ½ pound ground sirloin. Served on housemade bun, with dill pickle spear, housemade sweet pickles & one side. Topped with melted bleu cheese crumbles & grilled onions. Our signature recipe seasoned ½ pound ground sirloin. Served on housemade bun, with dill pickle spear, housemade sweet pickles & one side. Topped with grilled mushrooms, onions & swiss cheese. Our signature recipe seasoned ½ pound ground sirloin. Served on housemade bun, with dill pickle spear, housemade sweet pickles & one side. Topped with cheddar-jack, bacon, BBQ sauce & onion ring. sliced mesquite turkey and Virginia ham served over a toasted English muffin, topped with pimento cheese then broiled. Served open-faced with house-made sweet pickles& choice of one side. Thinly sliced grilled sirloin &melted swiss. Au jus, dill pickle spear & one side. On ciabatta bun with bacon, provolone, lettuce, tomato, dill pickle spear & side of dijonaise. Served with one side. Choice of chicken, thinly sliced grilled sirloin or veggies, with cheddar-jack, peppers & onions in a grilled spinach tortilla. Lettuce, tomato, housemade salsa & sour cream on the side. Veggies only 10. The best in town! 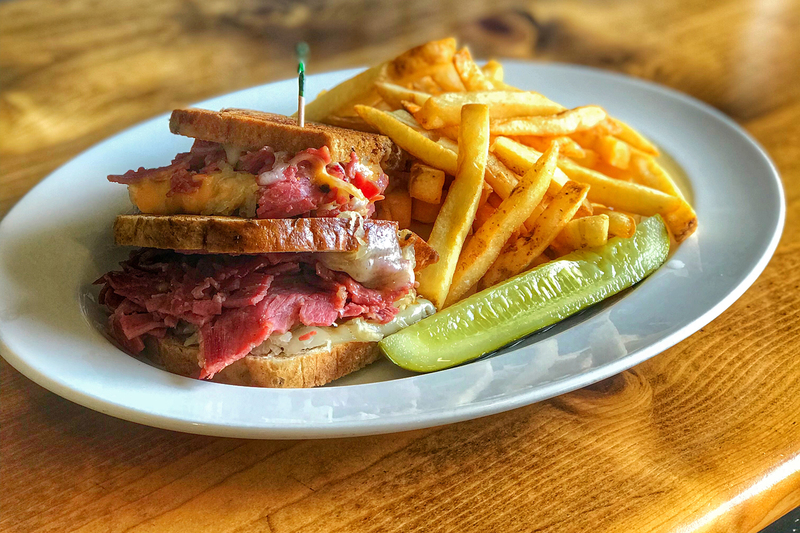 Corned beef, swiss cheese, sauerkraut, 1000 island on rye bread. Served with dill pickle spear & one side. Grilled or blackened. Fresh baked roll & choice of two sides. Brilled beef tenderloin on fresh baked biscuits. Au jus, dill pickle spear & one side. Scoop of chicken salad on pineapple slice, topped with amaretto sauce & almonds. Cranberry salad, pimento cheese roll & poppy seed bread. Shredded chicken, water chestnuts, celery & diced onions in a creamy casserole topped with seasoned bread crumbs. Cranberry salad, fresh baked roll & one side. Shredded chicken in a parmesan cream sauce with poppy seeds & buttery cracker crumbs. Served over white rice. Cranberry salad & fresh baked roll. Housemade quiche of the day, cranberry salad & poppy seed bread. 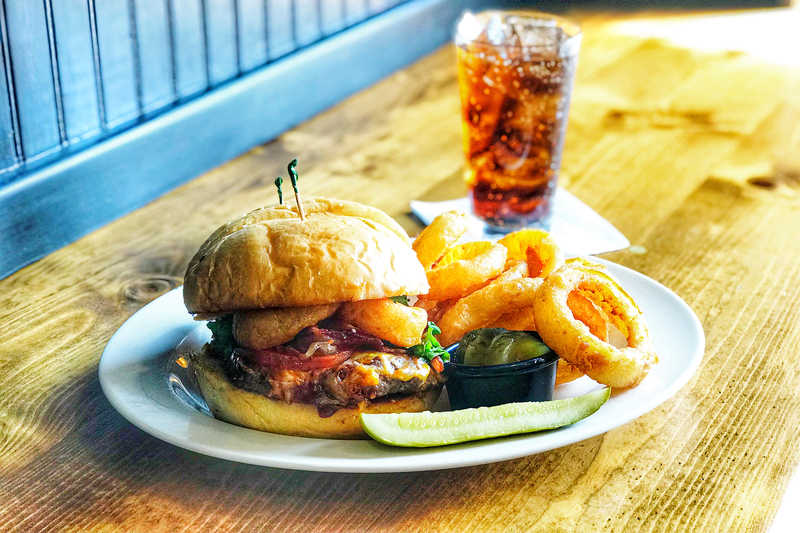 Thick cut fries, home fries, onion rings, fried green tomatoes, fried okra, green bean fries, potato casserole, fresh fruit, grilled asparagus or vegetable of the day.